The current term that is recommended to describe this cohort of patients is ‘tendinopathy’. Cook and Purdum (2015) have proposed a new strategy when approaching tendon pain, and this is called the tendon continuum. They propose there are 3 stages to this continuum. 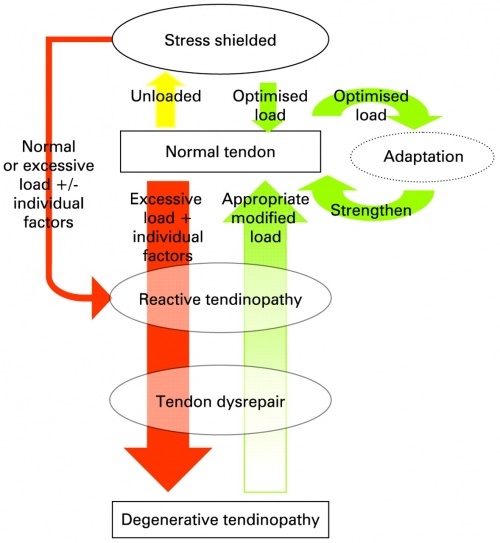 The Reactive tendinopathy, the tendon disrepair and the degenerative tendinopathy. They suggest that the tendon can move up and down this continuum and this can be achieved through adding or removing load to the tendon especially in the early stages of a tendinopathy. They suggest that by reducing the load it may allow the tendon to return to the previous stage on the continuum. A reactive tendon is the 1st stage on the tendon continuum and is a non-inflammatory proliferative response in the cell matrix. This is as a result of compressive or tensile overload. The cells change shape and have more cytoplasmic organelles for increased protein production (proteogycans and collagen). During this process the collagen integrity are usually maintained although some elongation separation has been shown previously. This phase is a relatively short term adaptation, this process thickens the tendon to reduce stress and increases the stiffness. On imaging the tendon does appear to be thickened and swollen due to the changes in the proteogycans. This can occur after a sudden increase stress or direct impact to the tendon. At this stage of tendon has the potential to revert back to the normal tendon. This is the final stage on the continuum and is suggested that at this stage there is a poor prognosis for the tendon and changes are now irreversible. It has been documented that there areas of cell death, trauma and tenocyte exhaustion and general disorganisation of the cell matrix. On imaging there are areas of this degeneration scattered throughout the tendon and interspersed with normal sections of tendon and parts of the tendon that are in the dysrepair phase. The tendon can be thickened and present with nodular sections on palpations. Clinically this tendon is present in the older individual who has had ongoing problems with tendinopathy, or the younger individual who has continued to overload the tendon.